Mrs B was just settling down for an afternoon snooze inside the chicken house when Blackadder’s loud squawk interrupted her plans. Miss Q said something but it was too quiet for Mrs B to hear, and that annoyed her. If her afternoon snooze was going to be interrupted by the rest of the flock, she wanted to at least listen in on the conversation. Feeling distinctly ruffled despite her recent preen, Mrs B leapt down from the perch and scampered back outside. “They haven’t given us any corn, Blackadder!” she reminded him. “But we want corn!” Mrs B and Blackadder protested in unison. “Well, I’m sure we will have some soon enough,” Miss Q said, hopping up onto a branch and settling down for an afternoon nap, “Maybe they’re waiting for you two to stop being so noisy? Now. 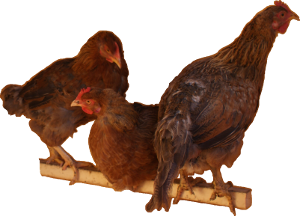 If you could refrain from shouting for a few minutes, some of us would like a rest.” She tucked her head very deliberately under her wing and ignored the other chickens until they wandered off, muttering theories and plans to each other.